In 1996, the WWF was in an interesting spot. 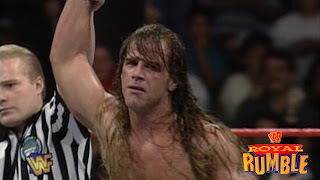 With Bret Hart as WWF Champion, and Shawn Michaels beginning his ascension to the top spot in the company, it seemed these two were on a collision course to a battle at some point. 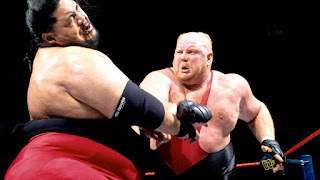 While that was going on, there were other names seemingly going through changes in the company, like Razor Ramon and Diesel, and though we wouldn't know at the time what their future held, their fate at the first PPV of the year would hint at it. The Royal Rumble in 1996 isn't my favorite by any stretch, but it had its moments, and today we go back in time and revisit this Pay Per View. Let's get into it. -This match is hilarious to me honestly. 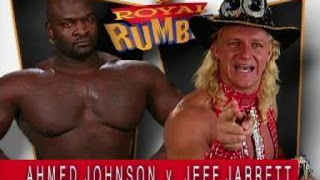 Ahmed Johnson, one of the most unintentionally hilarious WWF characters ever, is looking for payback against Jeff Jarrett after he got hit with a guitar at the previous PPV. Surely, Ahmed gets his revenge right? Well, Jeff Jarrett wasn't laying down for a Pearl River Plunging, Red trunk and boot wearing blac.... wait... well scratch that part. However, Jarrett didn't take the pin like he should have to put Ahmed over, instead he ends up hitting Ahmed with the guitar.... AGAIN. This causes a DQ. The match itself had a few decent moments, but it was short and the ending wasn't good. -First off, Skip and Zip were the name of the Bodydonnas who were like two white versions of Richard Simmons (if Richard Simmons isn't already white... which I'm not sure... hell I still think Marc Mero is secretly black). Regardless, they came in with a mission to take the tag team belts and they would come up just a little bit short of their goal. The Smoking Gunns were honestly a good team for the era and they would retain on a simple mistake where Sunny and her interference backfired a bit. This was a solid match, but admittedly, it isn't very memorable. -Nowadays, the Goldust character would probably be chastised by our sensitive society for making a mockery of gay people. Either that, or the world would say the WWF embraced the character and accepted it as such, though Goldust was just flamboyant and accompanied by his wife Marlena. Regardless, Goldust managed to get a shot at the Intercontinental Title after beating such great stars like Aldo Montoya and New Rocker Marty Jannetty, and Razor was in a weird booking space. He was the champion, but wasn't really booked that strongly since I don't think he was the first choice to carry the title anyways (remember HBK got injured and Razor won it from Dean Douglas). Razor and Goldust put on a decent match that ends weirdly with 1-2-3 Kid arriving and kicking Razor while the referee was distracted causing Goldust to get a pin. The match lacked storytelling and good psychology and was more about Razor being annoyed with the weirdness of Goldust (like most early Goldust matches) than anything. 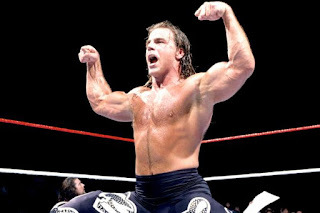 -First things first, this Rumble was touted as the return of Shawn Michaels, as he had been out for a month and some change after a fake injury happened in a match with Owen Hart. They really drove home this injury to build sympathy and while I guess it worked a bit, looking back, it was totally overblown. 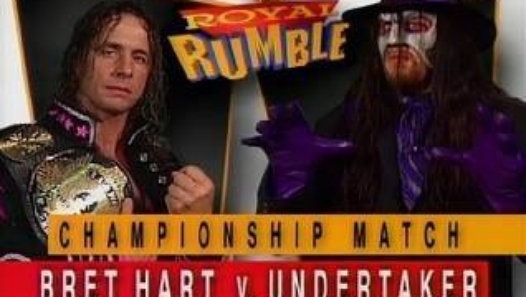 This Rumble had a lot of implications within it... none greater than what came from the Free For All match that took place before the PPV began. Hunter Hearst Helmsey and Duke The Dumpster Droese, two people who had no shot of winning the Rumble at all, took part in a war (or more like a boring sloppy match) to see who would be no. 1 or no. 30 in the Rumble. Whoever won got to be no. 30 and whoever lost got to be no. 1. HHH loses and he starts off the Rumble. Instantly, we knew he wasn't winning. 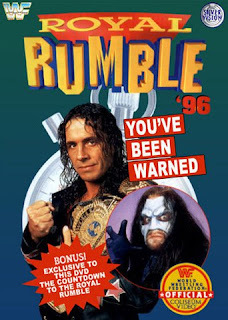 This Rumble featured some of the biggest names in wrestling at the time..... and by biggest names, I mean guys like Bob "Spark Plugg" Holly, King Mabel, Henry Godwinn, Savio Vega, Barry Horowitz, Isaac Yankem (word to Glen Jacobs) and all those classic legends.... yeah. Well, some legends were in this thing at least, like Dory Funk Jr., Jake The Snake Roberts, and Jerry The King Lawler, along with the cream of the crop then such as Yokozuna, Owen Hart, Diesel, Vader, Steve Austin, Kama (I guess), British Bulldog, and of course HBK. The final four? Diesel, HBK, Kama, and Bulldog. At this point, you know only two of those men would even have a shot at winning the Rumble and only one of them returned from "injury" and much fanfare. 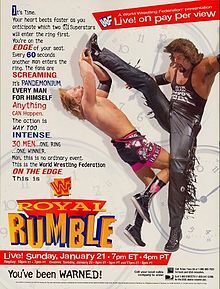 Bulldog goes over the top, Kama gets eliminated by Diesel and as soon as Diesel takes out Kama, HBK super kicks him over the top rope to win the Rumble for the second year in a row. 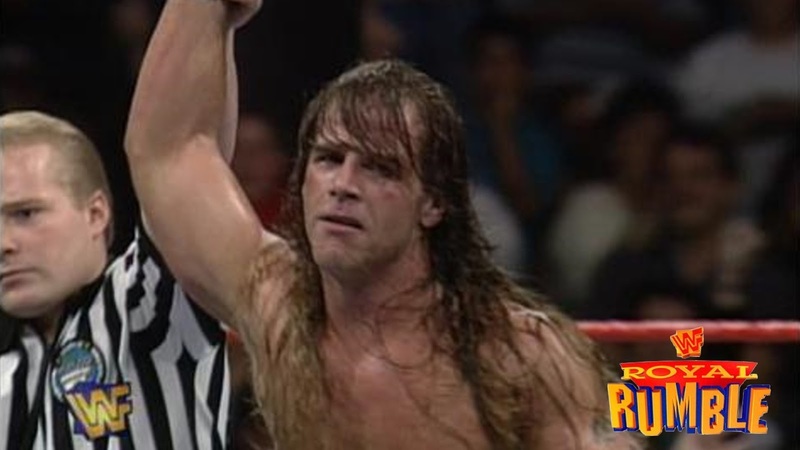 HBK won the Rumble in 1995 as a heel and in 1996, he won it as a face. Was this the right call? Considering the other 29 men in the Rumble, there really was no other choice to go with unless maybe a surprise Vader win or Owen getting the victory to take on his brother and win the belt. Otherwise? HBK winning works and was the biggest story of the night. 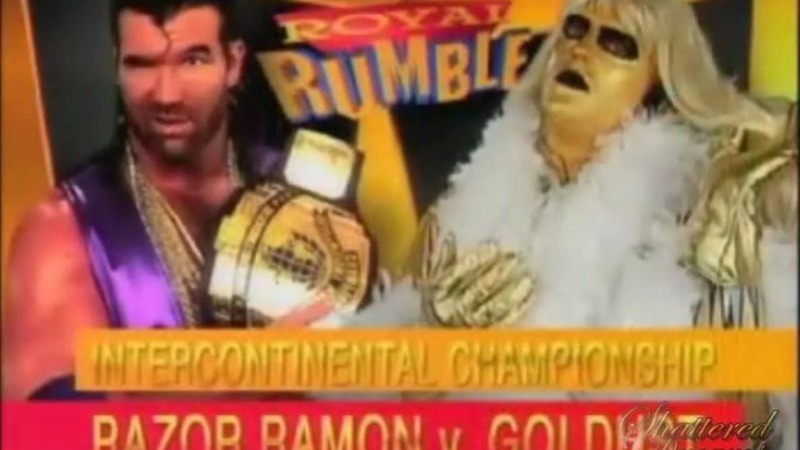 Oddly enough though, the Rumble wasn't the main event. -Diesel and Taker brawl a bit at ringside before the match really gets going, and this was to set up their Mania match, so it was obvious that Taker probably wasn't winning the title. This match was good however and it showed that Taker and Bret had some good chemistry together, but my only gripe is that it went too long for the crappy finish we would get, which ended up being a DQ because... you guessed it, Diesel interferes. Taker was close to winning and Diesel cost him, then flips Taker off. A pretty uneventful way to end the night and the show I'll say. While this PPV had a few good moments, overall it dragged and had nothing great on it, with the main event being the best match of the night, but even that dragged some. If you want to watch a Royal Rumble as you prepare for this year's, just skip this one.